At the town council meeting of 26th August the recent flooding on 8th August was prominent in people's minds, and it dominated the planning discussions. In the public forum Stephen Clark spoke about Louth Town Football club. "We are looking to progress through the leagues," he said. "We are looking to be a community club. An astroturf gives us that much more community business." Referring to plans for sports facilities on the industrial estate, Councillor Jill Makinson-Sanders said: "I think it's a huge shame that the club isn't going to be offered ten acres instead of five." Josh Davies, a former pupil of KEVIS, explained how the poor state of Louth's pitches was a problem. "For two to three months of any year we were told we couldn't play. The pitch was not in any fit state to play on... I think we could have gone a lot further with the right facilities. In two years at Grimsby I've had one game cancelled." So the football team want nice pitches, which is understandable. But what was less clear was what it had to do with any planning matters on that evening's agenda. Councillor George Horton updated the council on the progress of the Wolds and Marsh (WAM) community radio, and explained that the group had applied to Ofcom for a license, so far with no competition. "We are getting together the equipment," he said. He appealed to the council for a letter of support, which would help the group in its applications for funding. The Mayor, Councillor Andrew Leonard, commented on recent flooding in town. "Nothing seems to be achieved," he said. "The more tarmac we nail down in Louth the more we leave ourselves open for flooding." The Town Clerk, Linda Blankley, had some positive things to say about the forthcoming events to mark the anniversary of WWI. "We've gone bigger and better than ever before," she said. Exhibits are welcome "as long as we have table space and they are not too precious." The event is called Wolds in Wartime and it will be held on the 11th, 12th and 13th of September at the Sessions House, in conjunction with Lincolnshire Heritage Open Days. Last time the council met they voted in favour of consulting with a lawyer about taking ELDC to judicial review over the way it dealt with the sale of the cattle market. In that meeting the council set a budget of �800 for an initial consultation. But it turns out that isn't enough, and the price is �1250. Ouch. "Whatever it costs, I think we've got to do it," Councillor David Wing said. "Yes, we should carry on," Councillor Margaret Ottaway said. "After the farce that they had at East Lindsey." "It's not the council paying this, it's the people," Councillor Pauline Watson said. The council voted by nine votes to two (with some abstentions) in favour of paying the extra money. Another thing that may cost more than we expected is the running costs of the Louth Flood Alleviation Scheme. "The costs are more than we anticipated and may run to thousands of pounds," the Town Clerk said. "The benefit to Louth in the long term has to be with it," the Mayor said. Councillor Makinson-Sanders pointed out that the flooding that took place on Friday, 8th August wasn't river flooding. She called the alleviation scheme "very expensive." The council discussed further pedestrianisation of the town centre after getting feedback from the town partnership, following proposals from a member of the public. Councillor Fran Treanor commented on proposals to remove the traffic island on Mercer Row outside Bargain Buys, saying: "The whole of this scheme is in a very small space. It's a nightmare to get through at the best of times." "On market days the town centre is closed off anyway," Councillor Horton said, noting that there were "no problems" with that. Councillor Wing said he had been "on from day one about pedestrianising Mercer Row." On the topic of the taxi rank he said: "The best place to relocate them is outside the Turk's Head." However, Councillor James Pocklington warned that "making the traffic one-way is going to create a huge problem at the end of Church Street." Councillor Makinson-Sanders said she didn't think the proposed scheme was "thought out properly." The town council ended up voting in favour of leaving the town as it is and not pedestrianising further. In the planning section of the meeting Councillor Sue Locking told the councillors about ELDC's decision to allow outline planning permission for 39 houses on Mount Pleasant. 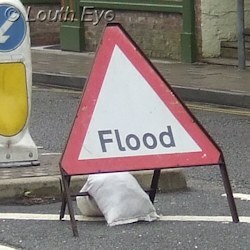 "It is dangerous," Councillor Eileen Ballard said, referring to the difficulty of driving around that part of Louth. The council considered plans for 46 homes off Eastfield Road. Councillor Pocklington was critical of the applicants' projections for drainage, saying "this application has got it wrong. They've allowed eleven litres per second run-off. There's no consistency. Any greenfield site has to work out exactly what the existing run-off is." Councillor Trevor Marris cited "six to nine inches of muddy brown water," which he described as "a river" on the A157 roundabout on Friday, 8th August. He suggested that the council refer to that in their objections. "It isn't something that happens because of climate change," Councillor Eileen Ballard said. "It's been happening forever." The council voted to object to this application. On Ramsgate Road, where Hi-Lite Signs used to be, developers submitted plans for 57 houses. "On the grounds of planning we felt that this ticked pretty much all the boxes," the Mayor said. However, Councillor Pocklington objected to the increased flood risk, noting that the site is mainly grass at the back. "It is just throwing more water down our drains," he said. The council agreed with him and voted to object to this application. There was a small victory for the developers in the application to build one house in Harewood Crescent. "It seems to me it was squeezed in," Councillor Pocklington said. Nevertheless the council voted to support these plans. When the council discussed another plan for a single house, this time on Little South Street, things went differently. They voted to object to the plan on the grounds of poor access and site layout. Next, the council objected to plans for six dwellings on Brackenborough Road on the grounds of a lack of parking, poor layout, and over-intensification. When it came to plans for four bungalows on 33-35 Mount Pleasant, the Mayor said: "We weren't at all happy with this." However, the application already had outline approval, which meant that the council couldn't object on the grounds of potential access problems. So they voted in favour of supporting this application, with a condition relating to surface water. Finally, plans were put forward for 98 houses on Park Avenue, on the site of the Louth Town Football Club. Councillor Pocklington criticised the drainage plan for this application, saying: "It's not going to be enough." "People I've spoken to are dead against this," Councillor Chris Green said. The Mayor said: "I think we have to be careful with this, but we can't turn down every application based on flooding. Otherwise we're just going to be ridiculed." However, Councillor Pocklington said: "I think the primary issue is the flooding issue. As climate change takes force it's just going to get worse." Councillor David Hall suggested that the council could also object based on the means of access to the site. And they did object. So, of 213 possible houses they could have approved, just five got the okay. I'm sensing a pattern here, and it's not one that's going to benefit anyone looking for affordable housing near Louth. It's also not going to be much use to council tax payers, who will end up potentially footing legal bills for a lot of planning appeals.